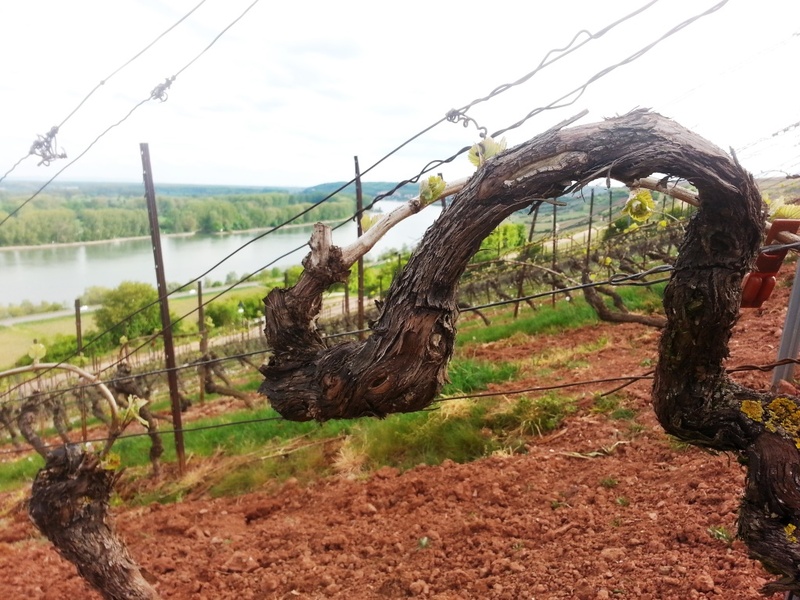 I cannot believe it took me this long to write up our visit with Gunderloch winery last June. But finally, finally I found the time and being in the right spot for it. There is so much emotional connection to this winery for me. I’ve lived in Nackenheim until I went off to studies in Trier at age 19. Gunderloch winery is a mere 200 meters away from my home. I went to primary school with the owners’ eldest daughter. I know all of their children rather well. And yet, until that tasting, I never had a “real” tasting with them, as in sitting down and trying their wines in a specific order the way I tasted through Mosel wines that I love so much. I guess it is a common phenomenon: You don’t give as many thoughts about what is physically close as to what is further away. It’s like the gorgeous cathedral in Oppenheim, just two villages south of Nackenheim, that I only visited the first time when I was 17. And I was struck how awesome it was. Before that visit, I knew it existed but I never really bothered. Gunderloch is pretty much a household name for any American Riesling drinker. Fritz Hasselbach, the current winemaker and husband of owner Agnes Hasselbach-Usinger, has done an amazing job of promoting his wines abroad, most of all in the U.S. I remember his daughter telling me that she went to a presentation somewhere in the U.S. in the mid-nineties and Kevin Costner came up to her and praised her father’s wines. That was pretty epic at the time (now, I wasn’t even sure anymore how to spell his last name…). 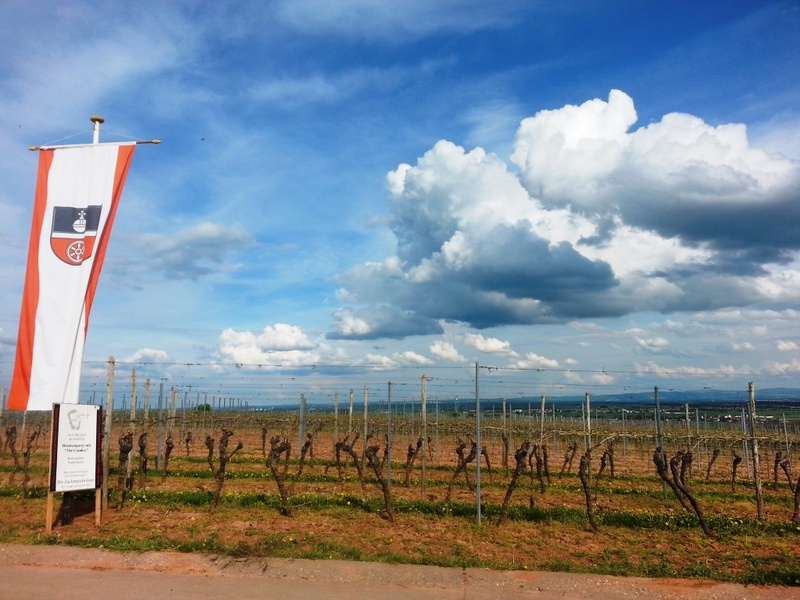 The winery was established by Carl Gunderloch, a banker from Mainz, in 1890 and is currently run in the fifth generation. 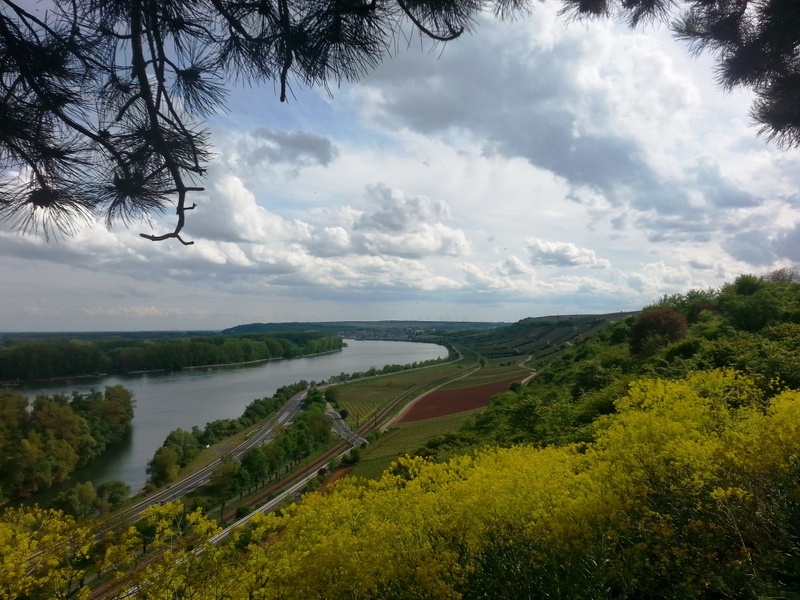 They own a bit over 12 hectares (around 31 acres) in Nackenheim and Nierstein on the so called “Roter Hang”, or red slope, a hill facing the Rhine going straight South from Nackenheim to Nierstein. 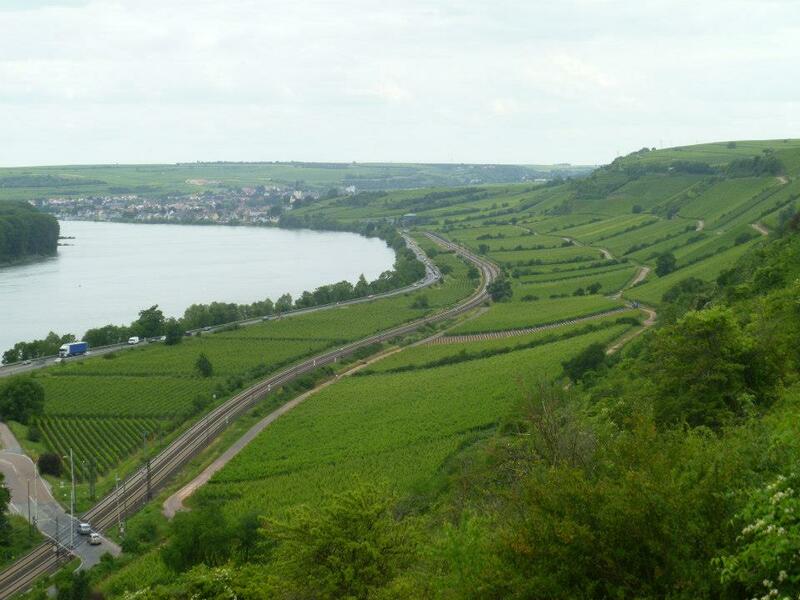 The Roter Hang is considered one of the prime spots for vineyards in all of Rheinhessen, the growing region. Gunderloch owns plots in the following vineyards: Nackenheim Rothenberg, Nackenheim Engelsberg, Nierstein Pettenthal, Nierstein Hipping and Nierstein Oelberg. They own an astounding 80% of Nackenheim Rothenberg, which together with Nierstein Pettenthal, is what they term their Grand Cru vineyards. Over the last years, Johannes Hasselbach, Fritz’ and Agnes’ son, has begun taking over making more and more of the wines with Fritz Hasselbach still very much involved in the wine making. 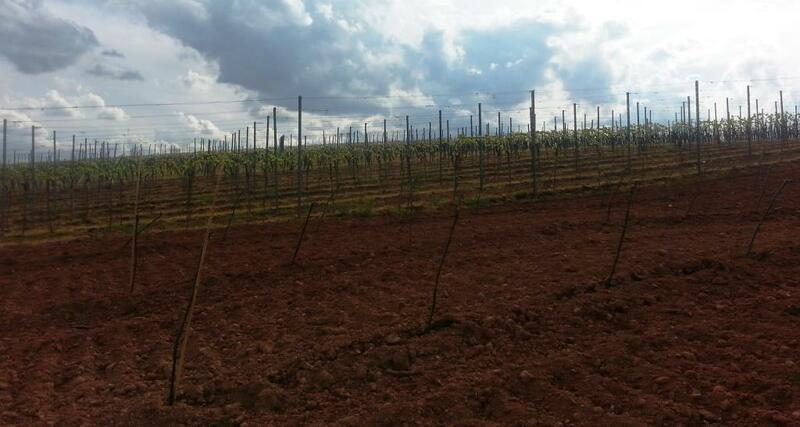 85% of their wines are made from Riesling, 5% each from Pinot Gris and Pinot Blanc, with the remainder being Traminer and Silvaner, and the red varieties Dornfelder and Pinot Noir. 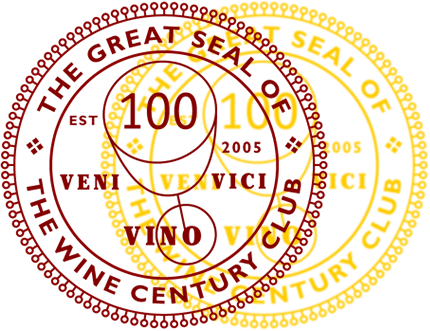 The winery has considerable clout, being the only winery that ever received 1oo points in Wine Spectator for three different wines, their 1992, 1996 and 2001 Nackenheim Rothenberg TBA. The 2002 Rothenberg Spätlese was named best Spätlese by the German wine guide Gault Millau and it remains one of the best wines I ever tried (completely tropical fruit bomb). If you want to know more about the estate, you should check out Rudi Wiest’s, their U.S. importer’s website profile of the winery. But to the tasting in June. I had contacted Johannes before we left for Germany and we managed to find a time for a tasting despite him being quite busy and in the midst of exams. I very much appreciated that. 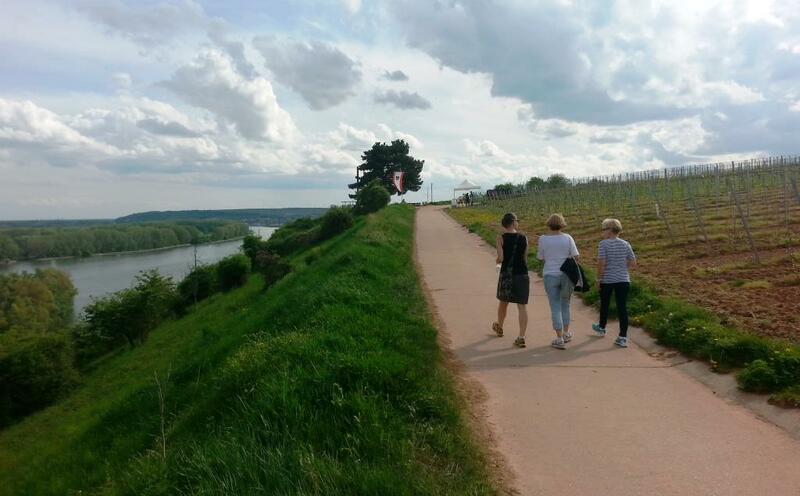 We took two friends along, a Canadian visiting us and a long time friend who just moved from Berlin to the Mainz area, and headed over to the estate on June 25, 2012. Johannes introduced us to their 2011 and some 2010 wines, a total of 13 wines. Up front, the line up was pretty impressive and there were a number of outstanding wines we tried. 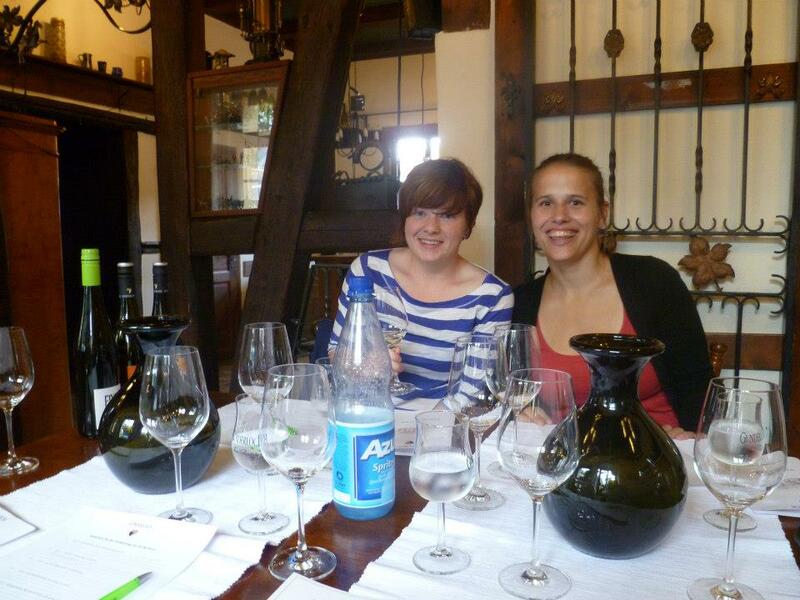 Johannes speaks great English and leads tastings in a professional and friendly way with lots of helpful insights. He started us off with showing us the characteristic red slate that forms the “red slope” which I grew up around. The slate on that hill is in different states of erosion, there are big plates of rock and small earthen chips of it. It crumbles rather easily was we experienced when touching it. We started off with a comparison of their 2011 Gunderloch Weissburgunder (Pinot blanc) and Grauburgunder (Pinot gris). I am usually not a big fan of either grape, but both these wines were seriously yummy. 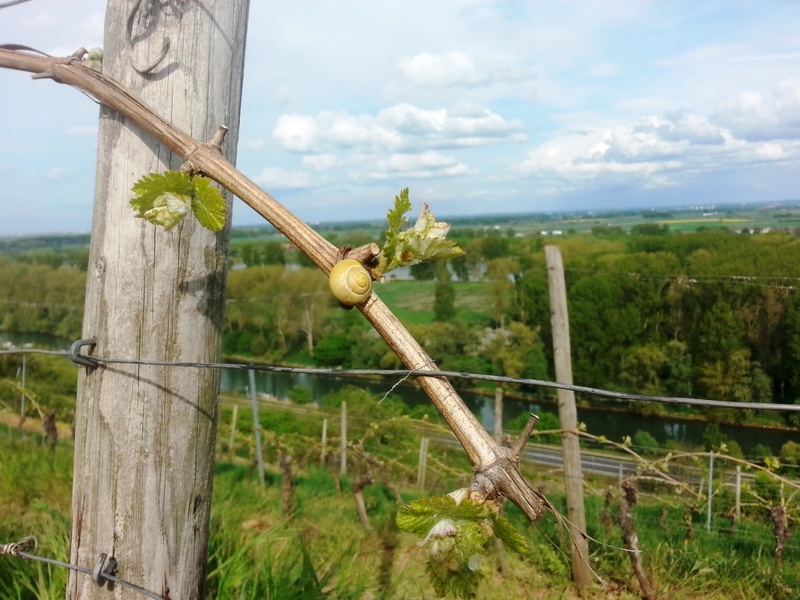 The Weissburgunder promised gooseberry in the nose and was creamy without being heavy. It confirmed the gooseberry on the palate with a slightly salty finish. 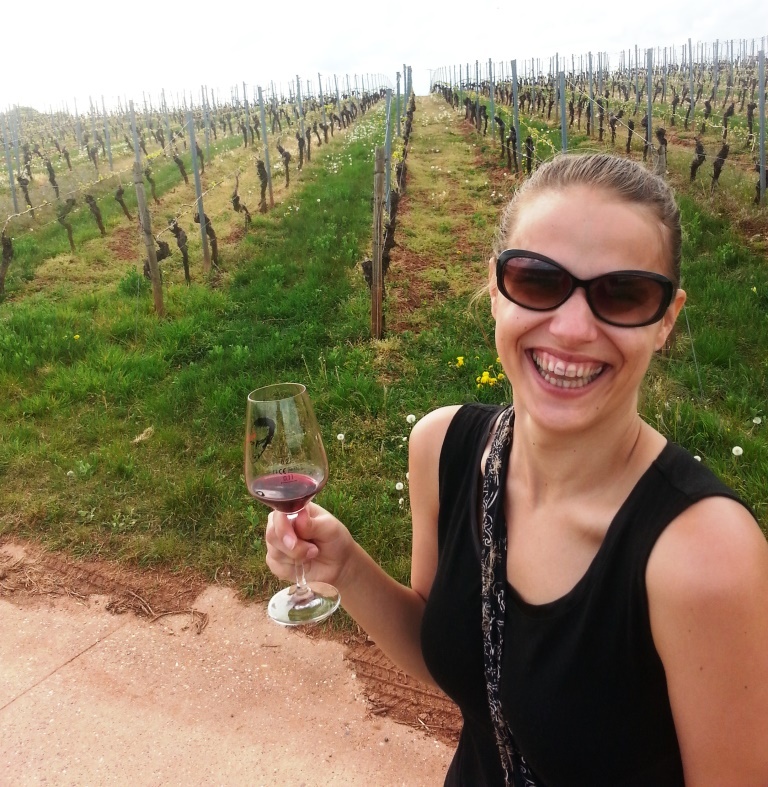 The Grauburgunder was heavier and riper than the Weissburgunder, with lots of peach aromas. According to Johannes, this was the first time that they harvested fully ripe Pinot blanc grapes. Usually they are not fully ripe which showed how warm 2011 was. Both wines can turn someone like me around who usually dismisses both grapes. We then tried the 2011 Fritz’s Riesling trocken, an entry level wine they produce for European countries, and a bit sweeter for the U.S. market. The nose was beautifully floral with light fruit aromas. On the palate I got citrus notes and some slight bitter aromas. At 12.5% this was an alright and easy drinking wine. And on to their 2011 Gunderloch Gutsriesling, their estate entry dry level wine. The nose was full of peach and some pineapple. On the palate, it was strong and spicy with citrus and bitter orange notes. According to Johannes it had a significant amount of acidity and showed great minerality. I couldn’t agree more and liked it quite a bit. 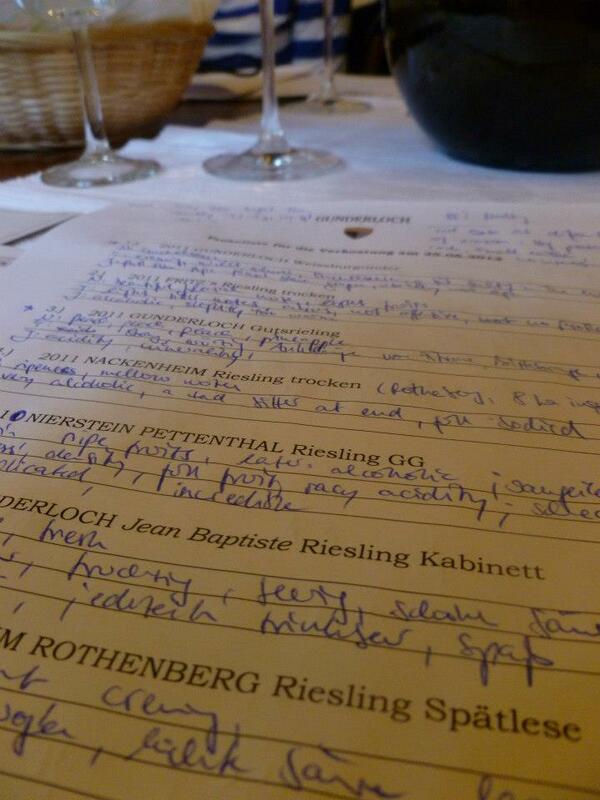 The 2011 Nackenheim Riesling trocken is their equivalent to a Burgundy village wine. On the nose, this wine showed ripe and mellow notes. On the palate it proved dry, full-bodied but too alcoholic for my taste with a tad of bitterness at the end. It seemed a bit closed and not quite ready. We compared this to the 2011 Nierstein Riesling trocken which I preferred much more: The nose had yellow fruit and peach aromas, and the flavor profile was alcoholic, citrussy and nicely fresh. Johannes explained that that was the usual set up for the Niersteiner and Nackenheimer Rieslings for them: Their Nierstein Pettenthal wines were usually more accessible early on with the Nackenheim Rothenberg wines coming later to the show. So it is always worth waiting a bit with the Nackenheim wines from Gunderloch. Lesson learned. The next dry wines we tried were their flagship dry wines. First up was the 2010 Nierstein Pettenthal Riesling GG (Grosses Gewächs, a VDP designation for the most outstanding dry wines from a grand cru vineyard a winery produces). This wine proved that I actually can like and enjoy dry wines! On the nose it showed raisins, ripe fruits and some alcohol. I wrote down “awesome nose” in my notes. On the palate, it was dense and ripe, full of fruit with a racy acidity. To me, it tasted like the best of Riesling which I usually find in the sweeter Riesling Spätlesen…this one had 13% ABV and definitely was not sweet, though, but I loved it! Seriously outstanding. 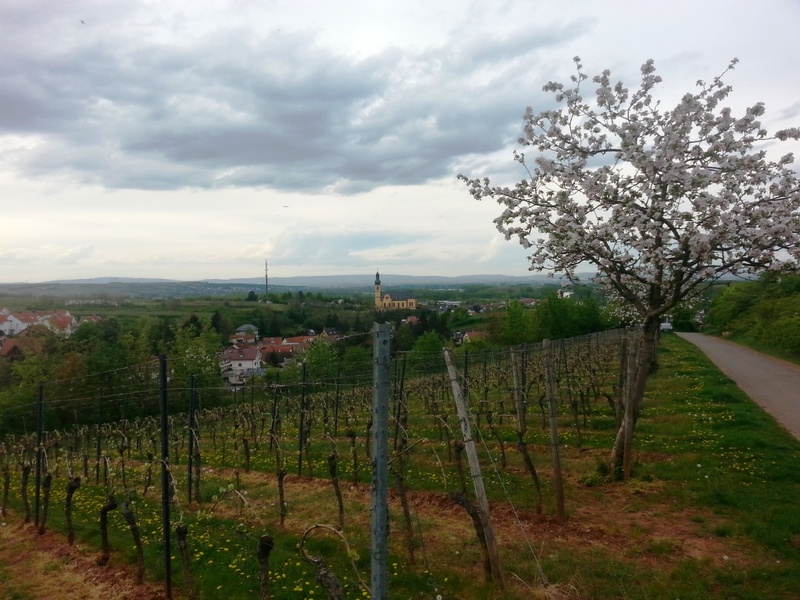 Given that this blog post is pretty long already I will post the remaining notes about their off-dry and sweeter wines in another post (over here)…suffice it to say that we had a great time and tried some great wines from one of the best sites in Rheinhessen. It really moved me to taste what I only had read before but was never able to fully appreciate: That I was lucky to be born along one of the few true grand cru sites along the Rhine. What a blessing. 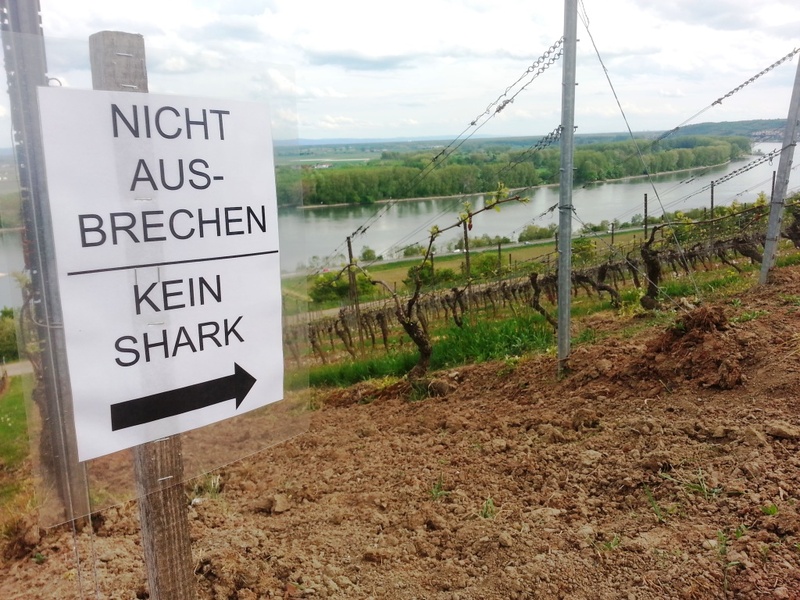 Because of their successes, the wines tend to be more expensive than the usual Mosel Rieslings I present here. But the upside is that their wines are easily available in the United States, so go grab a bottle if you can and let Gunderloch transport you to where I come from. Click the names for aerial views of the Nackenheim Rothenberg and Nierstein Pettenthal vineyards. 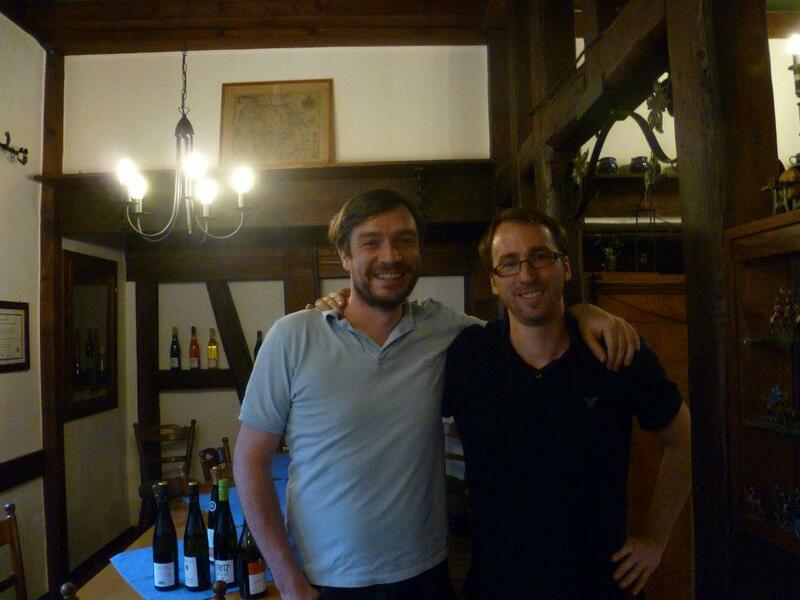 Johannes and I after a great tasting.